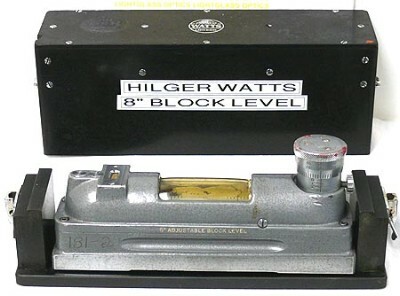 This Hilger Watts TB4 8" Block Level with Micrometer Tilt Adjustment is an extremely precise level, allowing fine adjustment of the position- and subsequent angular measurement- of the bubble. The micrometer allows direct measurement of 1 minute of arc, with fairly easy of interpolation to 15 seconds of arc. One revolution of the micrometer equals one degree. This instrument also includes a second small cross level to set this accurately. The level comes in its original factory bakelite box.